Welcome to Archive Decorative Concrete. Our showroom is a warm, inviting showplace designed to demonstrate the beauty of Kemiko Concrete Floor Stain. Kemiko stone tone stain transforms an ordinary concrete slab into a luxurious floor that resembles marble or glazed stone creating the appearance of expensive flooring for a fraction of the cost. 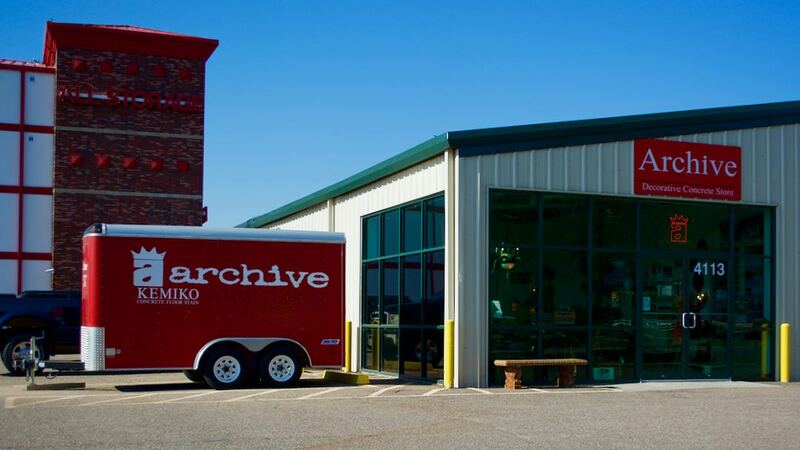 Archive is Amarillo’s premier source for Kemiko Concrete Floor Stain and decorative concrete materials for floors, overlays, counter tops and vertical sculpting. Kemiko is a permeant, basically maintenance free solution that will last as long as the concrete surface. Outdoor areas such as patios and driveways require only periodic resealing to maintain its original finish. Archive has all of the supplies, materials and tools in stock to help you complete your project. Archive also offers technical support to help insure that your project is properly completed. We look forward to assisting you or your client in creating beautiful, durable, and affordable stained concrete products that last a lifetime.